Meringues have always fascinated me. They are soft and light with an airiness and sweetness that seemed unattainable in my kitchen. After several attempts and failures I have found some ways to make the recipe I am presenting. Before describing the the recipe it is necessary to inform you that the meringues in this recipe have a sugar content less than what you normally find in many homemade meringue recipes and certainly lower than the industrial ones. Positive from the standpoint of health, but they have the disadvantage of being a perishable product. These meringues should be consumed immediately otherwise they will soften and lose their fragrance. Meringues are a great way to use egg whites which you sometime have left over from other recipes that require only the use of egg yolks. This way you do not waste anything, and you have happy family and friends! Whisk the egg whites very thick (use an electric mixer) with a pinch of salt. When they are mounted, slowly add the powdered sugar and granulated sugar, vanilla extract, while continuing to mount, then add a few drops of lemon. Cover the grill of the oven and another baking sheet with parchment paper. Using a pastry bag, draw 12 of meringue discs on the parchment paper (about 7 centimeters in diameter). Each disk has to be a bit spaced out to avoid the cooked meringues from touching one other. Arrange many small clumps of the remaining meringue batter on the baking sheet, which will serve for the final decoration. Put the meringues in the oven at around 225F (the lowest your oven will go) according to the type of oven. Cook for about an hour, taking care to open the oven often to let out any steam. After an hour, turn off the oven and keep the meringues inside for at least 12 hours. Meanwhile, clean the strawberries, cut into pieces and season with sugar, cover and let marinate in the fridge. In a saucepan, add the cornstarch, sugar, lemon juice, and water. Stir with a whisk to avoid lumps from forming. Bring to a boil and cook for a minute. Turn off the heat. Add a tablespoon of the lemon curd in a bowl, add the egg yolks, mix well and pour in with the rest of the cream, stirring with a whisk quickly. Turn the heat and cook for another minute. Cool the custard, stirring often. Whip cream and add the final tablespoon of sugar. When serving the cake form a small pyramid. 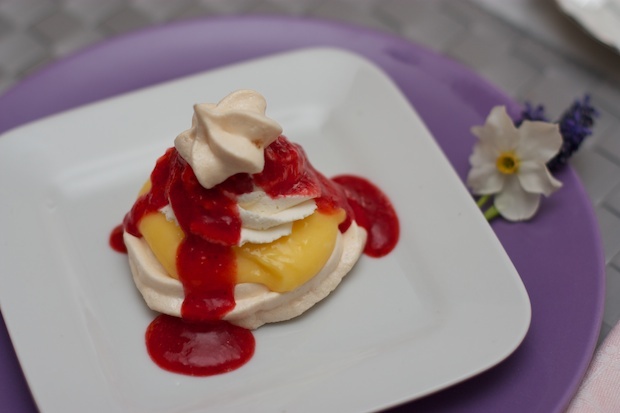 Serve on individual plates, first placing the meringue then a tablespoon of lemon curd, a bit of whipped cream, a spoonful of strawberry sauce, and finish with a small meringue.